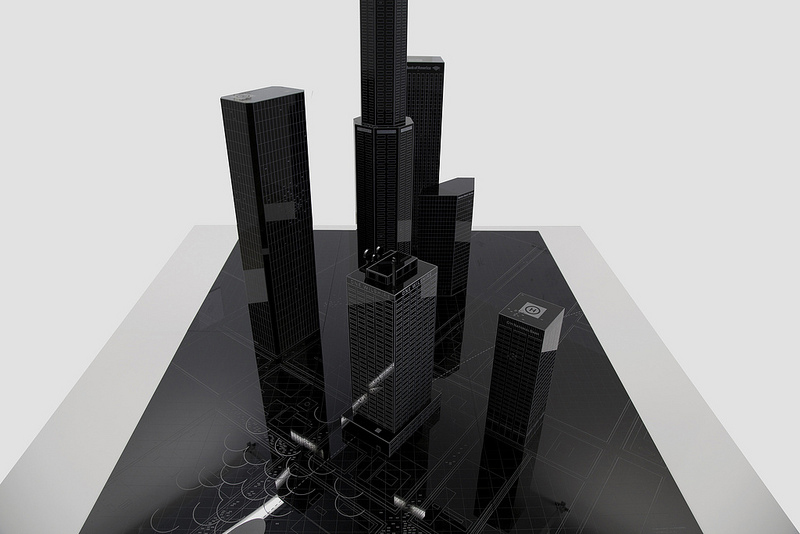 Armin Blasbichler’s students presenting their heist plans. Courtesy of Armin Blasbichler. Blasbichler certainly wasn’t the first to think of a heist as architectural or artistic practice. As far as we know, Janice Kerbel was the first artist to do it—she meticulously planned out her heist on a London Bank and detailed it in an exhibition and book. But authors and screenwriters did it long before she did (though maybe not as meticulously). In this week’s episode we look a three different heists with designs that go from the spectacularly complicated to the deceptively simple. Mastermind: Ilona Gaynor. Location: Los Angeles, CA. Ilona Gaynor is a designer and artist based in London whose work was influenced by the artist, Janice Kerbel. She designed an intricate heist set in Los Angeles, California because she’s interested in the “feedback loop” that happens between real-life heists and those in Hollywood movies. From about 1960 to 2000, L.A. was the bank robbery capital of the world. In the worst years there were more than 2,500 robberies a year in L.A.; that’s about one robbery every 45 minutes of the working day. In 1983, L.A. had more robberies than the next four highest cities (New York, San Francisco, Portland, Oregon and Sacramento) combined. In the spirit of the Hollywood-style heist, Gaynor’s heist is meant to be a spectacle. 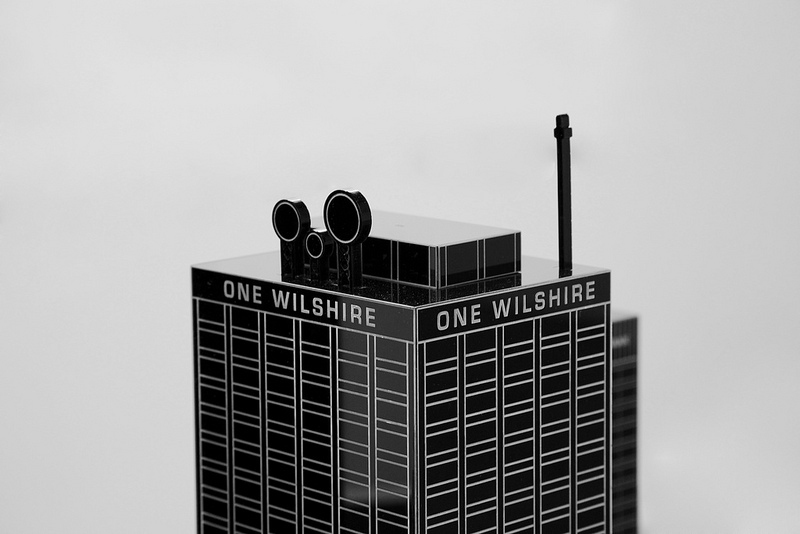 It begins with a plane crashing into the high-rise, One Wilshire (a building that houses computer servers) in L.A. As emergency responders are busy with this distraction, five banks in the immediate surrounding area are being robbed. Gaynor’s plan involves drilling concentric circles into the banks, pulling out the vaults, and loading them onto a truck. 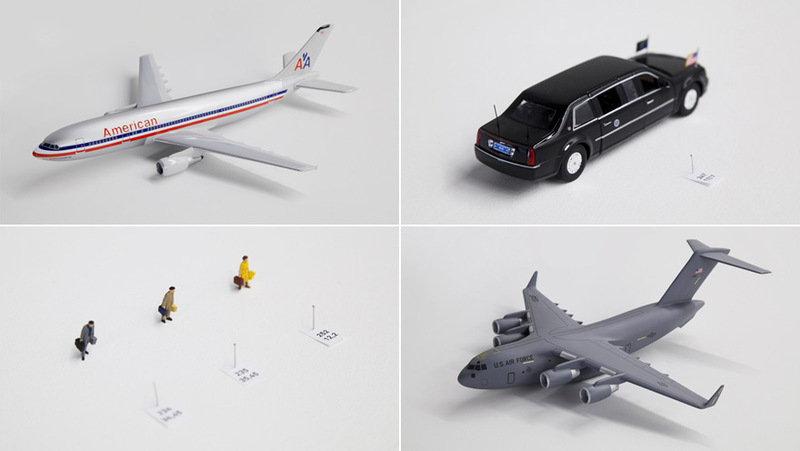 When her work is finished, it will consist of model reconstructions (like those pictured above), short-films, sculptures and photographic prints that re-tell the story of the heist. In 2013 she ran a Kickstarter campaign to fund her work. Mastermind: Russell Gewirtz. Location: New York City, New York. In the early 2000s, Russell Gewirtz wasn’t a writer, he hadn’t been to film school and he had nothing to do with Hollywood. He was just a guy, working real estate, who liked thinking about the “perfect heist” as he walked past an empty bank on his way to work every day. 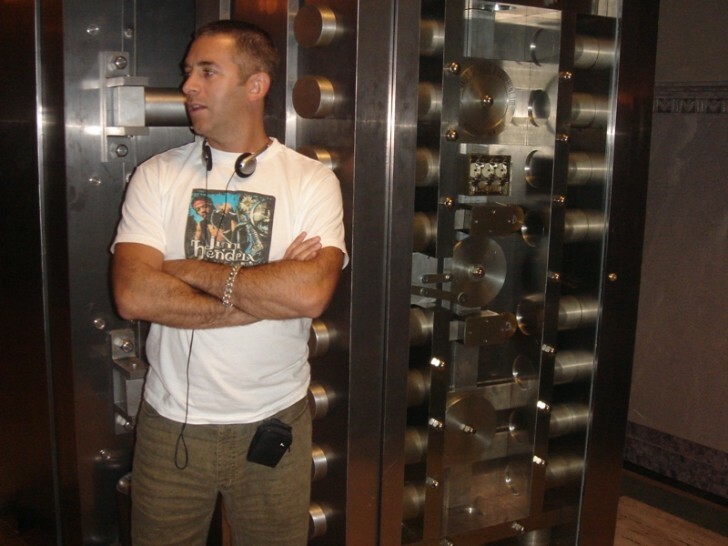 Russell Gewirtz on the set of Inside Man. Photo courtesy of Russell Gewirtz. 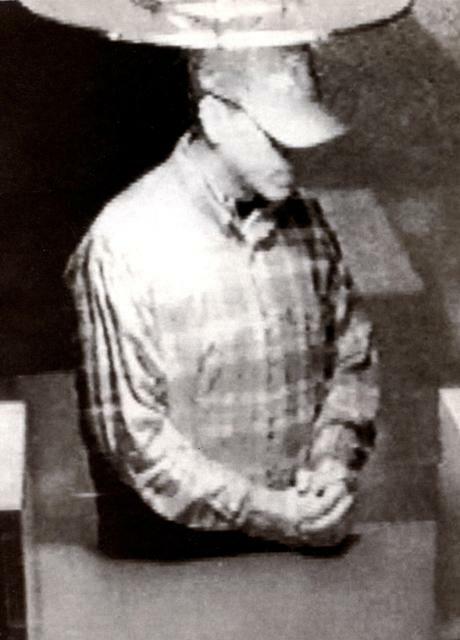 Gewirtz decided that the perfect heist could be done by dressing the hostages up like the robbers so that when it was all over, the police wouldn’t be able to tell who was who. The hostages put on the same outfits that the robbers are wearing in Inside Man. The hostage/robber switcharoo was clever but Gewirtz knew he still needed a way for the robbers to get their stolen goods out of the bank. The stolen goods couldn’t go out with the hostages/robbers, so he decided to have the robbers literally build a solution. They construct a small cell with a false wall hidden behind some shelves in the basement of the bank. One of the robbers stays hidden in this cell for a full week until the police are done gathering evidence. 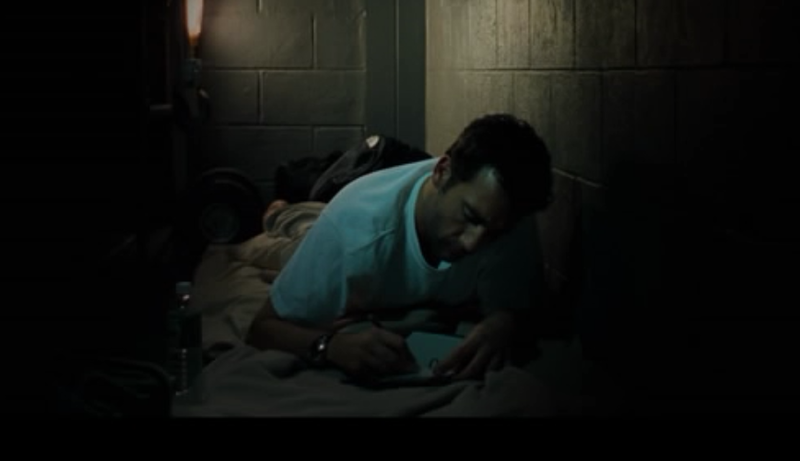 Clive Owen in the “cell” where his character hides with the stolen goods. Mastermind: Tom Justice. Locations: Illinois, California, Wisconsin. The heists designed by Gaynor and Gewirtz are both extremely complicated and involve multiple players and a lot of moving parts. In other words, their designs leave open a lot of chance for things to go wrong. 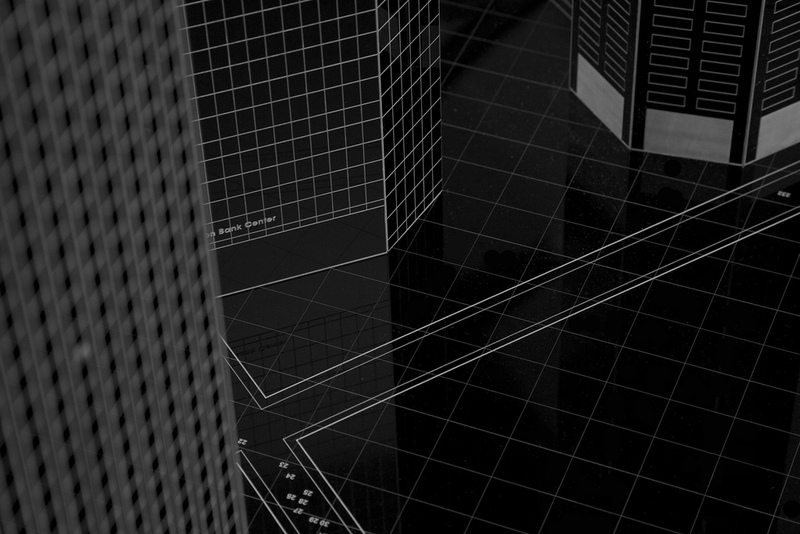 Tom Justice’s design was to go to a bank alone, approach a teller, present a note saying this is a robbery, and walk out without a lot of fanfare—which, according to FBI statistics, is how most bank robberies happen. And unlike the previous two designers, Justice actually carried his out in real life. 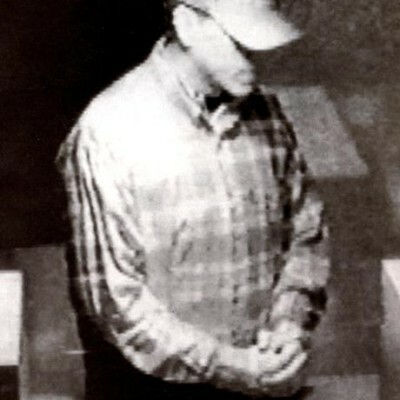 The FBI called Justice the “Choir Boy Robber” because he always folded his hands and set them on the counter and kept his head slightly bowed. Tom Justice says he kept his hands folded to put tellers at ease. Courtesy of Tom Justice. Before his first few bank robberies, Justice practiced obsessively. His bicycle was his get-away vehicle, and so the first thing he’d do was figure out where he was going to leave the bike (unlocked) while he was inside robbing the bank. From there, he counted steps, observed police patterns and made notes for months before actually carrying through with the robbery. Over the course of four years, Justice stole close to 130,000 dollars from 26 banks in Illinois, California and Wisconsin. In his last few robberies, Justice did less planning and stopped observing local police patterns. While leaving the scene of his last robbery, he was questioned by a police officer and had to ditch his custom-made racing bike (above) and abscond on foot. 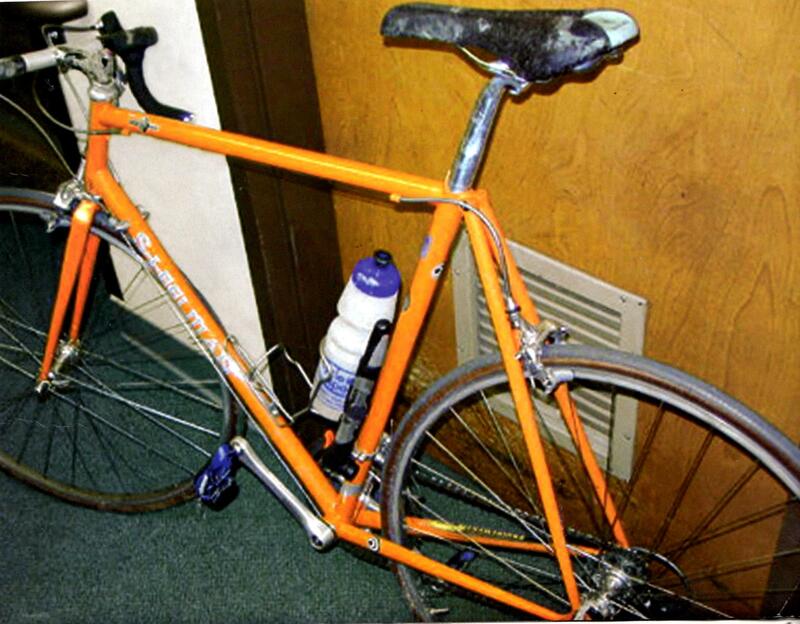 They didn’t find Justice, but they found the bike, which they ultimately traced back to him. Tom Justice spent nine years in prison and was released in 2010. In 1997 there was an actual robbery on a Bank of America that unfolded in a manner that seemed to some people (including artist Ilona Gaynor) to be suspiciously similar to the events in Heat. As in Heat, the “North Hollywood Shoot-Out” ended in violent exchange of gunfire between the robbers and police. 99% Invisible producer Katie Mingle spoke with artist Ilona Gaynor, screenwriter Russell Gewirtz, and Tom Justice. Thanks also to Janice Kerbel and Armin Blasbichler. I think that robbing a bank (or stealing from an art gallery) is an excellent mental exercise. I work for the product security team for a device manufacturer: we’re a very talented group of digital security experts and hackers. And one of my classic interview questions is an in-depth discussion about how to steal a painting from an art gallery. The most interesting part of the range of answers that we get is looking at who intrinsically obey the social rules of the art gallery (only open at certain times, have to enter the gallery through the doors, insiders aren’t thieves, etc.) and who immediately rejects the social rules to engineer a more advantageous situation. I think good attackers work out the assumptions that the security designers have made and seek to invalidate those assumptions for a competitive advantage. My favourite answers have been flooding the museum with sewage and stealing the painting when it’s being stored at the offsite backup, damaging the painting and posing as an art restorer, buying the painting when the plan became too intricate to be viable, and kidnapping my wife to make me steal the painting as I’ve clearly thought about it quite a lot. I think the art gallery would be a much easier theft than a bank. Banks do not want you to hang around. Galleries want you to come and visit and enjoy the art. Museums and galleries typically have less security. I seem to recall that there have been a run of smash and grab art thefts. The problem is not if you can steal it but what to do with it when you are done. Rob a bank and as long as the money is not marked you are home free. Rob a museum and it is a little hard to sell a Picasso with out bringing attention to yourself. The only way it works is if you already have a buyer. Create a fake person. Establish a long history of good credit and assets. Apply for and receive large loans based on your good fake name. Don’t pay them back. All hinges on that first step though… Not getting any easier. Having listened to the latest episode I thought I would share this with you. Its something I’ve been working on since January and has been a runaway sellout success. Basically tickets sold out in 4 hours… It would appear that people really love to live out their dreams of breaking into a building and stealing stuff! I was so pleased to hear this episode this morning and was just hoping the whole way through that Tom Justice would be the real heist mastermind, and then he was! I was really stoked and reading about Tom back when Casiotone For The Painfully Alone released this song about him. I used to work in an art museum. It would’ve been very easy to steal; nobody checked the packages shipped by the museum store and there were no cameras in the back rooms. We could have simply mailed the art. Work as a banker, then you can steal money from everybody and it’s legal!